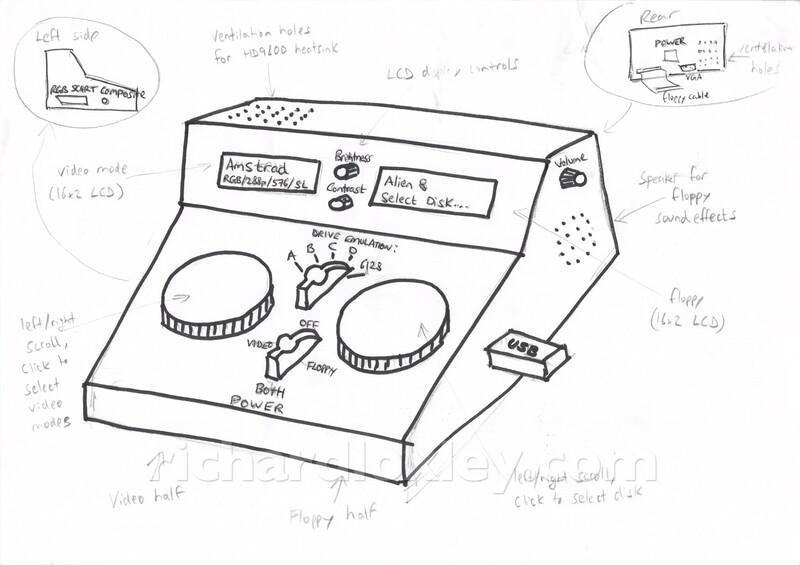 It’s now time to start prototyping the user interface for my RetroMatic 2000 box. As a reminder, the box will have two functions: a video converter to allow an 8-bit micro to be used on a modern monitor, and a USB stick floppy drive emulator. So today’s job was to get the rotary encoders working, and connect an LCD display to my Arduino Nano which will control everything. I’ve never worked with a 1602 LCD display before. I have done rotary encoders, but only on an ESP8266, so my code needed converting somewhat to work on an Arduino, which has a different interrupt model. The 1602 LCD display is using the 4-bit data transfer mode. I’ve hard-wired the read/write pin to ground (write mode), and I’ve hard-wired the contrast to ground as experiments showed that gave an acceptable level of contrast for this display. I used a multimeter to check that the LED backlight had a resistor already in series with it on the board, so I didn’t need an external resistor. That’s then just connected to 5v. All this means I only need 6 pins on the Arduino to control the LCD. I’m using the LiquidCrystal library on the Arduino, so the code is very straightforward to drive it. 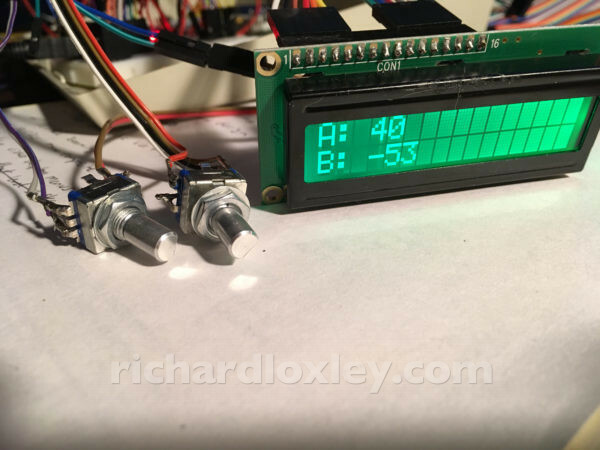 The rotary encoder inputs use internal pull-up resistors on the Arduino so they can just be connected to ground. 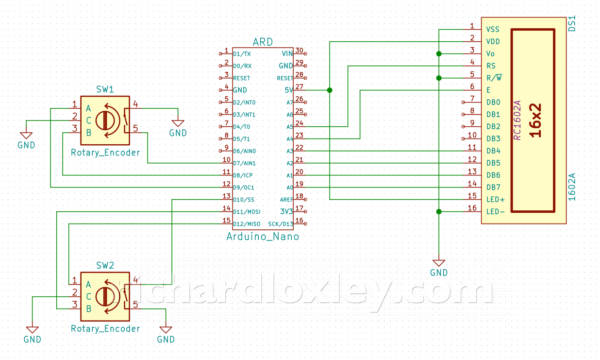 I had to read-up a bit on the Arduino interrupt model. I’m used to the ESP8266 wifi board, that allows arbitrary pin-change interrupt handlers to be attached to any pin. I had read that the Arduino only allows that on 2 specific pins, but I’d also read that it was possible to use as many pins as you liked. Which was correct? I needed interrupt handlers on 4 pins to use 2 rotary encoders. It turned out both answers were kind of correct! The Arduino allows full control (rising/falling/changing/etc) on only two pins, with high priority on the interrupt. But you can also have lower priority interrupts on any pin, the catch being they are only “change” interrupts, and the same handler must be used for each bank of pins on an Arduino input port. So you can do the same as the ESP8266, you just have to do some of the heavy lifting yourself in your interrupt handler. I found a great guide to all things to do with Arduino interrupts. Of particular use to me were the sections on pin change interrupts and correctly handling mutual exclusion when accessing multi-byte volatile variables. I’d learned when developing my ESP8266 rotary encoder code that speed is essential, so had used macros extensively, and used direct memory access to pins rather than the Arduino libraries (function calls add a considerable overhead to a fast interrupt handler). I followed the same model in developing the pure Arduino version. Check out the code at the end of this post if you want a closer look. 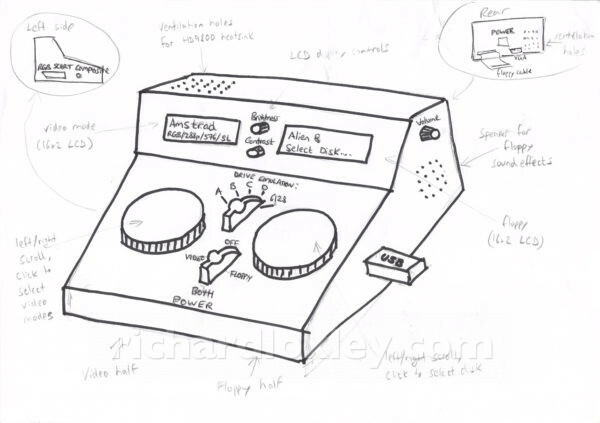 This entry was posted in Retro computing and tagged rc201704, retrochallenge on 20 April 2017 by Richard.